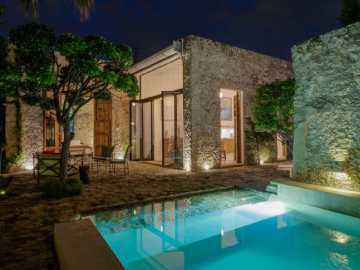 Casablanca A 3 Bed, 3 Bath, Hacienda Style, Private Rental Home With Pool In The Heart Of Merida, Yucatan, Mexico. It is only a 4 Block Walk to Santiago Market, Parks, Vendors and shopping. The house covers 6200 Square Feet of land with the interior part giving you a very private and spacious 2,800 Square Feet for added comfort. 3 Full Washrooms, Fully Equipped Kitchen & a Massive Living space with ceiling heights ranging from 16 Feet to 20 Feet, Alarm system, 14′ Stone, Outdoor, Perimeter Wall, for ultimate privacy, a Safe for valuables, Ample Parking, Large Swimming Pool, Covered Cabana with Loungers, Fruit Trees and so, so much more! For more specific details regarding Bedrooms, Bathrooms, Kitchen, Amenities – CLICK IMAGE Below. 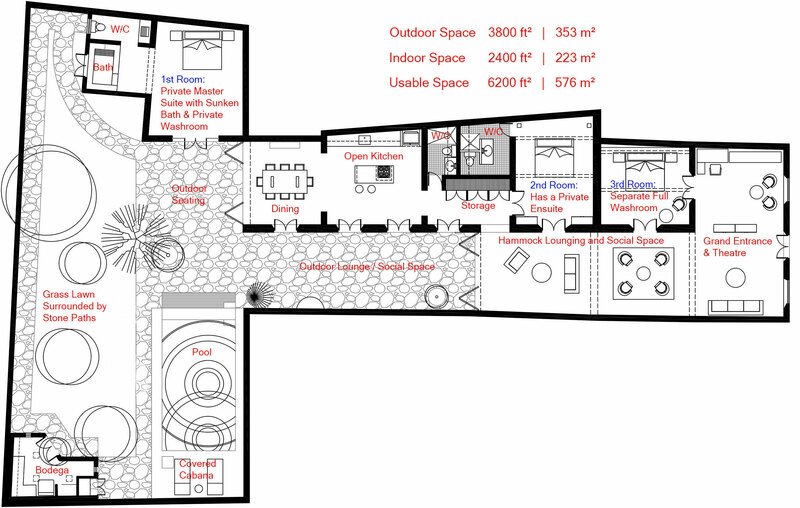 There are 3 different rooms, but all are very large and spacious. The Master Suite (1st Room) overlooks the pool and garden. It comes with an adjacent sunken tub with another set of doors that looks out onto the private side of this lush tropical garden and comes with an en-suite private washroom. The King size, Posturpedic mattress allows for the kind of sleep you’ve always hoped for. 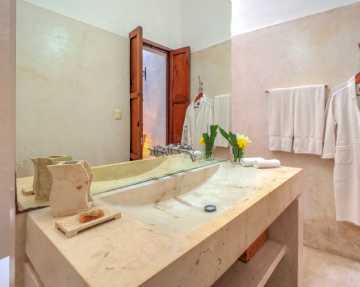 En-suite Bedroom (2nd Room) is located inside the home with a fully equipped, completely private bathroom with rain shower and comes with soaps, fresh towels & shampoo. 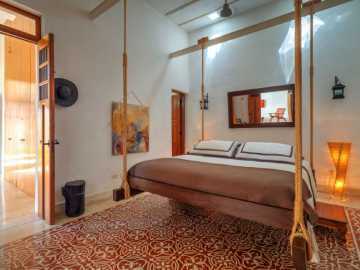 The Bed is King size and is a “Hanging Bed” that makes one feel as if being rocked to sleep. Front Room (3rd Room) is just as spacious as the 1st and 2nd rooms and comes with The Bed is King size “Hanging Bed” as well, however the private washroom for this room is just steps outside the room. It too is fully stocked and has a rain shower as well. All of the bedding comes with either Italian Cotton Sateen Sheets or Linen sheets, with Ultra Soft, Non Allergenic Pillows, Air Conditioning, Armoires and Unique Bedside Pullout Tables. Shampoo, Conditioner, Hand & Body Soaps, Fresh Bath Towels, Hand Towels & Face Cloths, Mats, Robes, Blow Dryer and Rain Showers. An Iron & Ironing Board is also available. Enormous full kitchen with all the essential utensils, dishes and glassware, frost-free refrigerator with filtered water dispenser and ice machine, 5-burner gas oven, dishwasher, blender, coffee maker a full dining area. Epson Projector for watching a show on the 5 meter by 3 meter wall, Panasonic Blue ray CD / DVD Player with iPhone adapter plug in & charger (bring your own cable) Panasonic Stereo, 30+ Award Winning Movies, 30 mp3 DVDs with 100s of great music selections, Wireless Internet, House Information Booklet, Sofas, Chairs & Tables, Extensive lighting and Traditional Yucatan, Hand Made Hammock. Sorry we do Not have a TV. The outdoor space (the yard & pool areas) make up the balance covering 3800 Square Feet of garden, sun and shade. It consists of 18+ tropical plants, trees and spices including an Avocado Tree, 3 Lime Trees, a Niranja (sour orange) Tree and various other Floral Trees, Palms, Fresh Herbs, a Stone Path surrounding the perimeter of a beautifully manicured lawn with a Barbecue Pit in the middle. There is plenty of area for sun tanning and shade space for relaxing and taking a long siesta! To refresh you, there is a large swimming pool (4 Meter x 8 Meter x 1.5 Meter) next to a covered Cabana with Loungers. The water is filtered and brought up from the natural river that runs under the city of Merida. There is a hammock lying across the pool for cool water lounging, allowing you the peace and quiet to really relax and enjoy the sun. In the evening the entire home is lit to emphasize the beauty of the surroundings. Most people don’t even want to leave as it is truly so calming.